What is the Blade & Soul game? Blade & Soul is a Korean fantasy martial-arts massively multiplayer online role-playing game developed by NCSOFT (Team Bloodlust). The video game made is published globally now. Blade & Soul features a combination of martial arts inspired combat and qinggong in an open-world environment. Players create playable characters that explore around the world by completing quests assigned by various NPCs. The game uses a real-time battle system in the third person camera view and requires players to "combo" a series of attacks, much like that of fighting games. Dungeons are typically the major farming location, and sort less of innovative that tend to be traditional. The graphics is the most praiseworthy part of the game, especially for its female characters. All features indicate the Blade & Soul another rehash MMORPG if the PvP isn't as well as current. Each of the seven classes has their own unique approach to combat that feels highly distinctive, all gears are purchasable by BNS Gold, a Blade & Soul Currency earned from loots and quests rewards. So, it's totally free-to-play if you treat it as casual game to kill time. Why buy Blade & Soul Gold and Items from Joymmo.com shop? 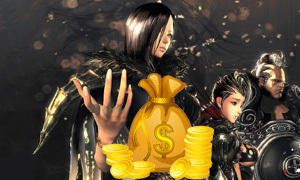 We provide a wide range of Blade and Soul Gold & Itmes for all servers in-game, such as NA Server, EU, DE, and FR Servers. Best advantages are lowest price, 100% legit, security trade, and fast delivery. 24/7/365 Live Chat online supported.